Quentin Pickard has provided this colour photo which he dates to around 1976/7, 'what a lot of dilapidated and sad set of buildings there were then in the High Street'. 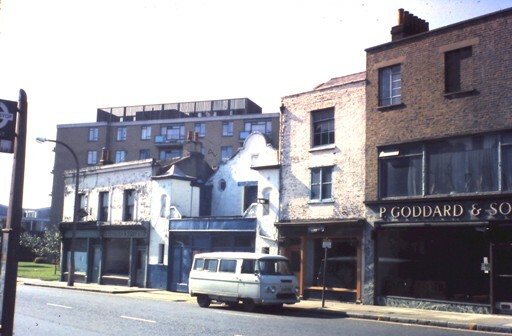 The leftmost property is numbers 273 and 273a, originally the site of the Kings Arms public house. Next door parts of the frontage of the Coronet cinema are visible, this closed in 1928 and a garage and then electro-plating business used the premises. No. 276 was a snack bar in 1940. Joseph Goddard and then Percy Goddard ran businesses at no. 277 from 1890 onwards, Percy Goddard also used no. 273a: the name is just visible in the original image. Behind loom the Berkeley House flats, built in the 1960s.